With Christian Ehrhoff's rights being traded to the New York Islanders today for a 4th round draft pick, the Isles have exclusive negotiating rights for the next few days before the July 1st deadline. At which point, Christian Ehrhoff is free to return to Vancouver, but don't count on it. This move by the Canucks signifies one of two things. Either Ehrhoff wanted more money than the Canucks could offer, or the Canucks did not care to offer much money. 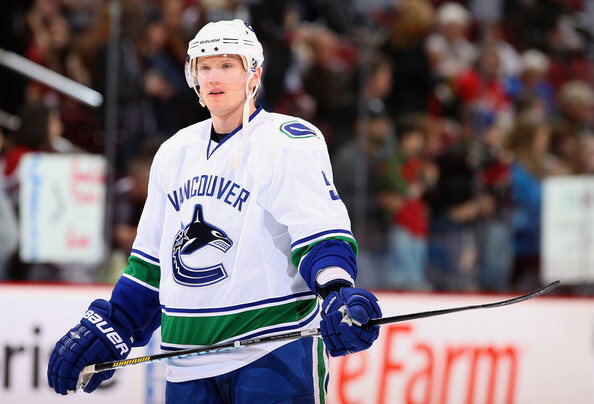 Rumour has it that Ehrhoff was offered Kevin Bieksa's contract, at $4.6 million a year for 5 years. If that's true, Ehrhoff perhaps wants more. His stats over the past two years suggest he could command around $6million on the open market. But with the Sedins, Luongo, Kesler, Burrows and Bieksa all taking a hometown discount to remain together and press for a Stanley Cup, why would Christian Ehrhoff be any different? Well, consider the Canucks' circumstances heading into next season. As CapGeek.com illustrates, the Canucks have roughly $51 million locked up in eight forwards, five defensemen, and two goalies. That leaves the Canucks with $13.3 million in cap room to obtain at least one more defender, and four forwards. Chris Tanev is a likely candidate to nab that number six spot, leaving the club with roughly $12 million for four forwards. Indeed, whether Ehrhoff declined tangible offers, or if the Canucks strategized and wished to cut him loose, it may not be a bad thing. With the Sedins, Kesler and Burrows locked up long term, along with Mason Raymond, Manny Malhotra, Maxim Lapierre, and Mikael Samuelsson, the Canucks have four forward spots open for next season. Expect Cody Hodgson, Jannik Hansen and Viktor Oreskovich to return, leaving one spot open depending on when Raymond returns. The good news here is with so much of the Canucks high-end talent locked up, it is mostly bottom six positions left to fill: players that will be earning around $1 million each. The Canucks will therefore have some cap space to play with for the first time in a couple of years. Hansen - Malhotra - ? In fact, Canucks' fans could have reason for optimism. The Canucks could have used some scoring depth in the post-season, perhaps a consistent scorer to play with Ryan Kesler. This development may allow the Canucks to do just that. With Raymond injured, Chris Higgins unlikely to return (according to various reports), the Canucks may have as much as $8-10 million in cap space to sign a free agent, or make a trade to nab a scoring winger and beef up their top six forwards. The Canucks also can survive without Ehrhoff. He had a strong season with 50 points, but was a team worst -13 in the playoffs. Aside from statistics, the Canucks played without Sami Salo, Dan Hamhuis, and Alexander Edler for prolonged periods last year, so the loss of one defender should not strike fear in fans' hearts. This could free up significant cap space to improve the roster elsewhere. If you want further justification for letting Ehrhoff go, consider the salary structure of the team. With 20 roster spots being allocated to $64.3 million in payroll, you'd want 12 forwards at $38.58 million, six defence at $19.29 million, and two goalies at about $6.5 million. The Canucks already have $17.3 million locked up in five defenders, not including Chris Tanev, or the possibility of bringing back Sami Salo. Meanwhile, they only have $27 million of $38-39 spent on forwards. With the aforementioned four bottom six roster spots to fill, common sense would indicate that if the Canucks wanted to spend to the cap, there is much justification to spend that on a quality forward.